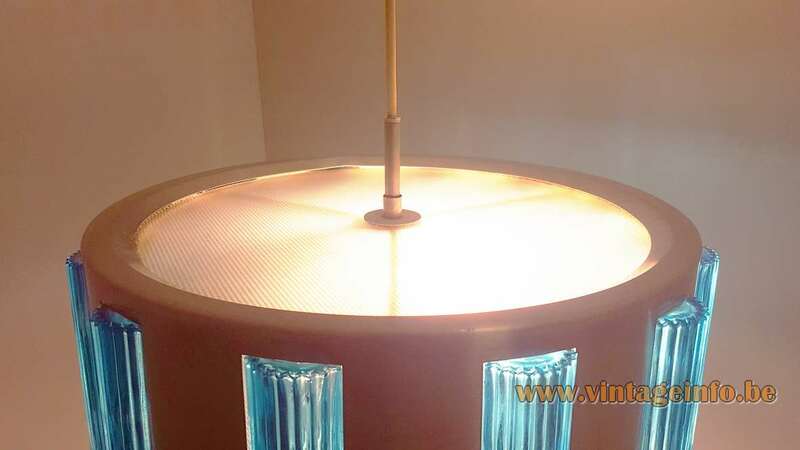 Materials: Metal (aluminium) round lampshade. Acrylic disc on the bottom and one on top. Blue coloured crystal glass rectangular rounded embossed bars. Bakelite sockets. Designers: Carl Fagerlund (1915 – 2011) – attributed. 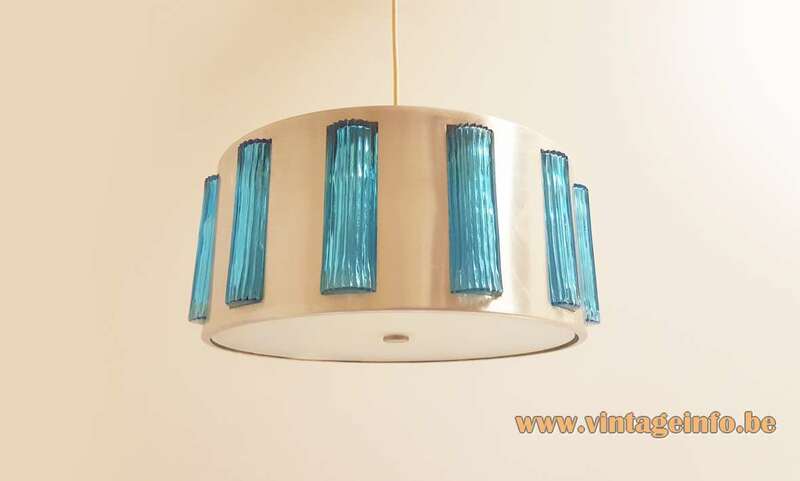 Manufacturer: A cooperation between Orrefors Glasbruk (Glasworks) from Sweden for the glass parts and Lyfa from Denmark. 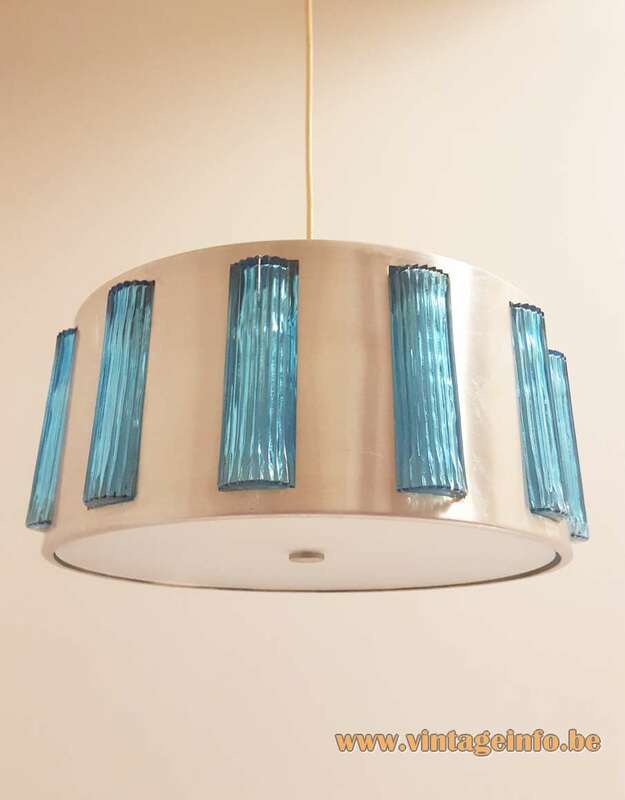 This drum shaped Scandinavian pendant lamp has a top and bottom of translucent acrylic with a pattern of small glass squares in relief and is very rare. Lyfa was founded in 1924 under the name of Københavns Lampe Og Lysekronefabrik (Copenhagen Lamp And Chandelier Factory). In 1930 the company was renamed into Lyfaca. They began producing table lamps inspired by the PH lights designed by Poul Henningsen for Louis Poulsen & CO A/S. 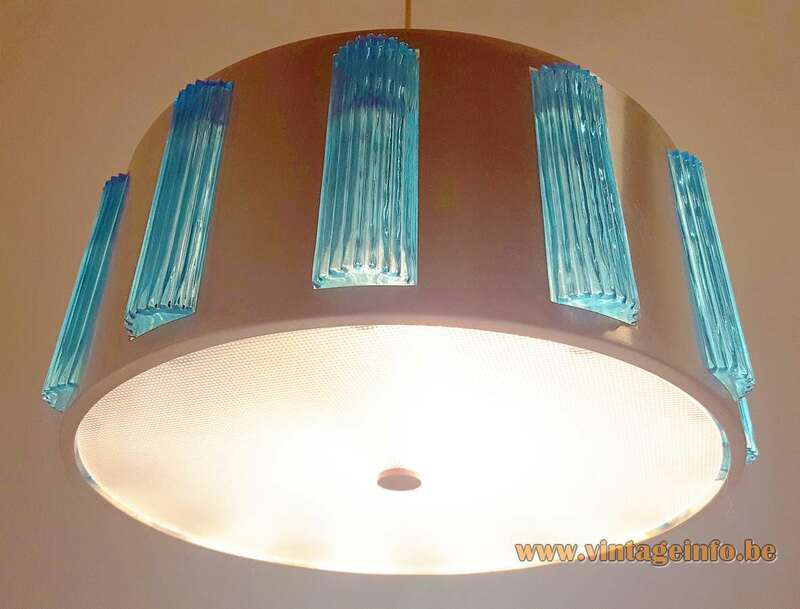 After the Second World War the company collaborated with leading architects and designers to produce minimalist and sculptural Space Age lights. The company received numerous awards. Designers that worked for the company are: Louis Weisdorf, Bent Karlby, Michael Andersen, Acton Bjørn, Claus Bonderup, Piet Hein, Klaus Helweg-Larsen, Simon Henningsen, Finn Juhl, Nils Koppel, Eva Koppel and off course Carl Fagerlund via Orrefors. 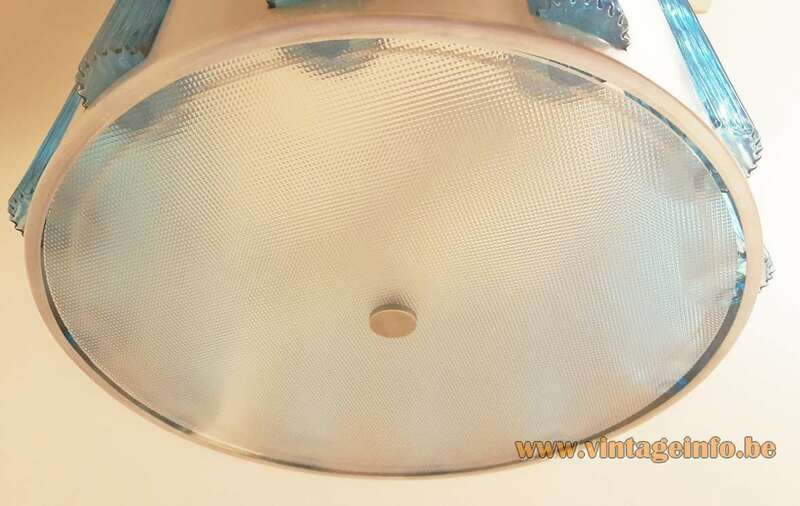 In the late 1970s Lyfa merged with Fog & Mørup, another leading Danish lighting producer. In the 1980s Lyfa-Fog & Mørup was taken over by Lyskær. The name changed in Lyskaer-Lyfa. 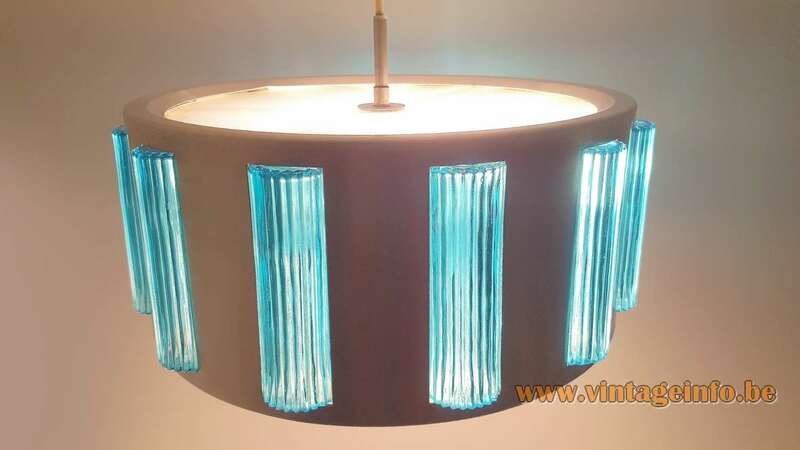 Lyskaer-Lyfa produced lamps until 1991 when it was incorporated into Horn Belysning A/S of Aalstrup. Horn itself was taken over in 2005 by Nordlux of Ålborg and at a large extent dismantled.